HBT Publications Reviews - Legit or Scam? 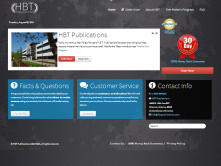 HBT Publications Free Mailers Program Reviews – Legit or Scam? HBT Publications is a company that was established in the early 1990s and claims to give people an honest chance to work for them, from home, and make a real income with no limitations. This company claims to hire people as “Independent Commissioned Mailers,” a job which requires you to mail out order forms for their company from the comfort of your home. HBT Publications says it can hire people to do this type of work from their home because it saves them so much money in overhead costs. They will pay their workers $5.00 per mailed envelope guaranteed, and all you need to start is to pay a $35 registration fee. After you register, you will be sent a kit of provided materials, including envelopes, brochures, and order forms for their “Free Mailers Program.” You will then follow detailed instructions to put together and process each of the envelopes. All the envelopes you receive will be addressed and stamped already. As long as you work for HBT Publications, you will never be expected to manage the cost of postage or mailing lists. They also promise that you will never be asked to sell items, you will never mail anything you might find objectionable, you will never have to speak to customers or handle products. There is a lot of skepticism surrounding “envelope stuffing schemes.” HBT Publications addresses this on their website, saying that companies who claimed that people could get rich off this opportunity and promised to pay exorbitant incomes for this work ruined the reputation of the industry. Instead, HBT Publications says that their promise of $5.00 per envelope is a realistic offer, and that you are guaranteed payment for each envelope you mail. In addition, they have a program which will allow you to earn even more money, by giving you the opportunity to make commission on sales which result from your mailers. This commission based opportunity is not really detailed on the website, unfortunately. However they do promise that if you are unhappy with their program that you are able to return their kit and materials within 30 days of receiving them and get a full refund of your registration cost. And if you stick with the opportunity, they say that your registration fee will be refunded to you automatically after you complete 100 mailings – the fee is only a safeguard for them to cover the cost of materials for people who order the kits and never complete their work. Average Rating for " HBT Publications " is 1.7 out of 5 based on 20 reviews. I have tested companies like this for many years a long long time ago when I was in my twenties. At least 99% of them turn out to be absolutely nothing at all. Many of them are programs that send you brochures that tell you to open a business in your own name and to copy the brochures and resell the program itself to others. That makes it an illegal endless chainscheme which also gets into the pyramid scheme laws. There are some people out there who make a LOT of money doing this. And... over time.. many of them go to prison for it. Especially nowadays when this sort of thing is so much easier to track and get caught doing and there is far more evidence left of it. These people are going to get into a lot of trouble. I signed up almost a year ago & never even got my kit.I called the BBB and gave them there info. HBT said they will give me my money back, so you know it's a scam. They also changed there phone no. and this was at least 6 months ago or more. given. Lost bucks on that. Suggest you save your money, and look for something that is legit. This is a complete scam!!. Made a purchase through their web site and NEVER got anything in the mail. I tried to track the package... made ph. call.after a few days, maybe 7 days after I did not receive package in the mail like they mentioned I would. We (my husband and I ) made several ph.calls...to never obtain a TRUE response. BEWARE...you will never get anything>>>>>it is a SCAM. I also talked to a Sarah several times. I was even told she almost sent me some of her mailers since I was not receiving any. Of course I fell for it. All I can say is that what they are doing to people isn't right. But I know Karma will get them sooner or later. It always does!!! How can we get the law on this company I been waiting to and talk to sarah also they should not get away with this. It was not based on sending info for sales of program. Did I want to work full time or part time...great! Received 2 pieces of paper in mail. Contacted company and Sarah called me. Again, I asked her how it worked..told same thing (3rd times received same answer). She asked if I wanted to work full or part time. Id receive a package in about 2 wks.... nothing...so I emailed company. They said it should take between 2-3 wks...ok...week 4 nothing...asked Sarah to call me and she did. She was soo surprised. She said that told her that noone was responding to ads and she do more...week 5 nothing..emailed company and no response. Tried to call..unable to leave message. Week 6 same thing. I even emailed and asked if they hadf shut off phones. We are on wk 7 now and guess what...zilch, zip, zero. Emailed and no response. Unable to leave a message. If you send your money after reading this, your nuts and deserve to lose your money. Its a scam in every sense of the word. Theres a special place for people like this and I hope they enjoy my $50 because they will have to account for their actions. Exactly! We should have known better. Never again will I trust any of these. I signed up for this home mailers program over three months ago. they sent me a brochure of other companies that pay you to work from home. I was told that after 3-5 weeks, the envelopes would be coming in every day. I have not seen even 1 envelope and neither have a moade a dime of my money back. They assigned me someone to work with me and I have not even heard from her. I have left several messages for her to call me back and guess what? I have not gotten a call back from her. Now, when I call them, they dont answer, but when I call from a different number, they would answer the phone and say that shes not in. I strongly suggest that no one try this "HBT Home Mailers program, because their going to take your money and send you to a dead end. Their not trustworthy. I'm very upset I got my guide 4 weeks ago and I yet to get my envelopes to stuff. The lady I talk to is Sarah and she gave me her cell number and everything, do she keeps in touch with me but no envelopes. Very disappointed. Oh and I send them sorry people 50 dollars to start this mess. Yep! I got ripped off also! I should have known it was too good to be true! Never again.